The mystery (sacrament) of chrismation immediately follows baptism. Chrismation is the fulfillment of baptism because the gift of the Holy Spirit is the new life we receive through Christ. Chrismation is our personal Pentecost by which we enter into new life in the Holy Spirit. This is what St. John means when he writes in his Gospel (20:23) "Receive the Holy Spirit. If you forgive men's sins, they are forgiven them; if you hold them bound, they are held bound". In the mystery of chrismation our entire body: forehead, eyes, nostrils, lips, ears, breast, hands and feet is anointed, sealed, sanctified, dedicated to new life. As he anoints the newly baptized, the priest says: "The seal of the gift of the Holy Spirit." Our entire person becomes a temple of God and our whole life is called to be total praise of God. In ancient times precious documents were wrapped securely and hot wax was dropped on the seams. 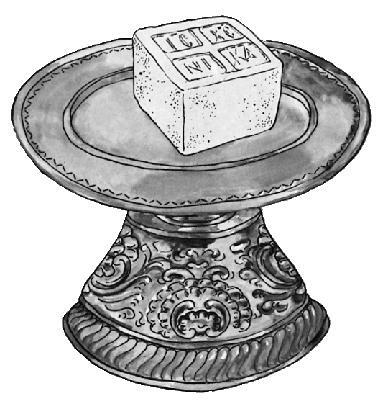 The king, or some person of authority, would take his ring and stamp his royal insignia into the warm wax, leaving the seal of sovereignty when the wax hardened. The seal of the gift of the Holy Spirit upon the Christian is the official mark of God's claim upon the person and is a sign of His presence in us. When an artist completes a beautiful painting, it is signed. When we write a check, we sign it. When a potter produces an original piece, a special mark is placed upon it. So it is with God. When God produces a new creation ~ as He does in baptism ~ He seals it with His signature: the Holy Spirit. "The way we know we remain in Him and He in us is that He has given us of His Spirit" (1Jn 4:13). We are not yet a completed work, God continues to create us daily and we need to cooperate with His work, so the seal of the gift of the Holy Spirit is also a promise. St. Paul writes: ". . . for that Spirit is the seal with which you were marked for the day of our final liberation" (Eph 4:30). The process of our salvation is justification, sanctification and glorification. This is God's work in us. We have God's guarantee ~ God's seal ~ that it will be so. The Spirit we have now received is a guarantee that one day we shall receive its full possession in the blessedness of God's kingdom: the glorification stage of our salvation. In the meantime as God sanctifies us each day, we carry the imprint of the One Who owns us. From the moment of our sealing we do not belong any more to ourselves but to Christ. The early Christians used the expression "to keep the seal" as a call to faithfulness to Christ. This faithfulness requires our conformity to Christ in all we say and do. This is what it means to witness Jesus in our life. Shortly before praying the "Our Father" together during the Divine Liturgy, we petition God: " Having asked for unity of the faith and for the fellowship of the Holy Spirit, let us commend ourselves and one another and our whole life to Christ our God." The prophets, especially Isaiah, prophesied that the Suffering Servant of the Lord ~ prefiguring Jesus ~ would be led to the slaughter. The passion and death of Jesus fulfilled the prophecies. Like a lamb, He was silent and opened not His mouth when led to the slaughter. Pilate sentenced Him to death on the cross as demanded by the Jewish leaders, He said not a word; The soldiers flogged Him, He said not a word; they stripped Him of his garments and nailed him to the cross, he said not a word. At noon on the day of preparation, at the very hour that lambs were offered in the temple, the Lamb of God, Jesus Christ, was immolated outside the city(1Cor. 5,7). Paul wrote in his Epistle to the Hebrews (9:12-15) that Jesus as High Priest entered into the sanctuary with His own blood and achieved eternal salvation for all mankind. Jesus offers Himself as an unblemished Lamb to the Father for the redemption of our souls from sins so that we might worship the living God in thanksgiving. Every time a priest celebrates the Rite of Preparation prior to the Divine Liturgy he commemorates the sacrifice of the Lamb of God. The prophecy of Isaiah is actualized. He takes a small loaf of bread ~ on which is the seal of Christ the Conqueror ~ and cuts a square particle, called a lamb, saying: "In memory of our Lord, God and Savior Jesus Christ"
"He was led as a sheep to slaughter. And dumb as a spotless lamb before his shearer, He opens not His mouth. The lamb of God Who takes away the sin of the world is sacrificed for the life and salvation of the world. During the singing of the Cherubic Hymn the priest transfers the prepared gifts to the altar. Thereupon the priest consecrates the host into the Lamb of God, fulfilling our Lord's command at the Last Supper "Do this in commemoration of me." Jesus Himself is our spiritual sacrifice to God. "Broken and distributed is the Lamb of God broken and not divided, always eaten, and never consumed, but sanctifying those who partake." "The servant of God partakes of the precious Body and Blood of our Lord and Savior Jesus Christ for the remission of his/her sins and for life everlasting." Thus Christ, the unblemished, pure and innocent Lamb of God, who is the fulfillment of the law and the prophets has fulfilled The Plan of the Father to redeem, save and sanctify humankind into eternal life. The anointing for the mystery of chrismation uses chrism. The holy chrism is a mixture of pure olive oil and precious balsams and perfumes. God gave the recipe for the holy chrism to Moses (Ex 30: 22-25) directing that it be used to anoint his brother Aaron to the high priesthood. It is with this oil that Christians are anointed as a royal people: "You are a chosen race, a royal priesthood, a holy nation, a people He claims for His own to proclaim the glorious works of the One who called you from darkness into His marvelous light" ( 1 Peter 2: 9). The fragrance of the chrism represents the fragrance of the Spirit filling all things. The chrism is prepared with great care, usually by monks or nuns in monasteries authorized by the local bishop. On Holy Thursday every year the chrism is consecrated by the bishop and then distributed to parishes to be used in the anointing at chrismation. St. Cyril of Jerusalem says: "You were anointed on the nostrils so that perceiving the perfume of Christ, you can say: 'We are the sweet perfume of Christ.'" This "sweet perfume" should fill the entire world with the Divine Presence in each baptized and chrismated soul. We pray in the Our Father "give us this day our daily bread." The Holy Eucharist is God's response to that request. Jesus said: "I am the bread of life. Whoever comes to me shall never be hungry . . . I am that living bread come down from heaven . . . the bread I will give is my own flesh; I give it for the life of the world" (Jn 6: 35, 51). At the highpoint of the Divine Liturgy, the anaphora, the priest ~ who has remembered all that was done in Christ for us, and who has joined our offering to Christ's own gift of Himself to the Father ~ calls on the Spirit to transform them. You and not for judgment or condemnation. Our Lord gives us a share in His Body and Blood so that we may be transformed by that sharing. As the prayer says, He gives us the Eucharist so that we may be transformed within: our sins forgiven and our souls cleansed. This transformation is interior within each participant. This transformation makes us a community in the fellowship of the Holy Spirit, a community not only with each other but with God. We are transformed into a body, the Body of Christ, by this sharing in the Eucharist. As St. Paul said: "Because there is one loaf, we, many as we are, are one body; for it is one loaf of which we all partake" (1Cor 10:17). Moreover, in the Eucharist the Lord wants to transform our way of relating to Him. As members of the Body of Christ, we are temples of the Holy Spirit. God dwells within us! The Lord transforms us into a people who are aware of our real place in His eyes: sharers in His divine nature and the dwelling place of the Holy Spirit. The Holy Spirit comes on Pentecost and manifests the world to come. The Kingdom is always taking us beyond the here and now. To be in the Spirit means to be already in heaven, for the Kingdom of God is joy and peace in the Holy Spirit. And thus, in the Eucharist, Christ Himself seals and confirms out admittance into the Kingdom; the Church becomes the Body of Christ. God's life comes to us as gift, a free and divine gift. This is why our Church calls the Eucharist the "Holy Gifts." The priest says: "The holy Things for the holy!" as he invites us to the holy table. And we respond ~ No, Lord, we are not holy ~ "One is holy, one is Lord, Jesus Christ, to the glory of God the Father." Regardless of all our human efforts, salvation remains God's gift to us. We receive the Eucharist as God's gracious gift. We accept this greatest of gifts in joy and gratitude. There is nothing we can do, yet we become all that God wanted us to be from all eternity as we receive the holy Eucharist. Grandma's Lap Grandma enjoyed telling the story of two men who were introduced to each other shortly after they had become Christians. One was a poor fellow from a godless background; the other from an affluent Christian family. After sharing their conversion experiences, the man from the religious family pondered aloud asking: "Why is it that you accepted Christ the first time you heard the Gospel and I allowed so much time to pass before truly accepting Him? "That easy to understand," responded the poor man. "Suppose a man came along and offered each of us a brand new suit. Well, I'd jump at the offer because all my clothes are rags. But your closet is undoubtedly filled with the finest of suits. It is much the same with salvation. You were satisfied with your goodness, so it took you a long time to realize your need for God's garment of righteousness offered you through Christ. But I am deeply aware of my shameful, hopeless, sinful condition, and I couldn't wait to receive forgiveness and cleansing." a blouse or shirt: "Lord, clothe me with the breastplate of righteousness." a belt: "Lord, clothe me with the girdle of truth." a scarf or tie: "Lord, clothe me in Your humility." a skirt or trousers: "Lord, clothe me with Your love." a suitcoat or jacket: "Lord, clothe me with Your gentleness and compassion." a coat: "Lord, clothe me with Your forgiveness." shoes: "Lord, clothe my feet with the gospel of peace, giving me firm footing in Your truth."